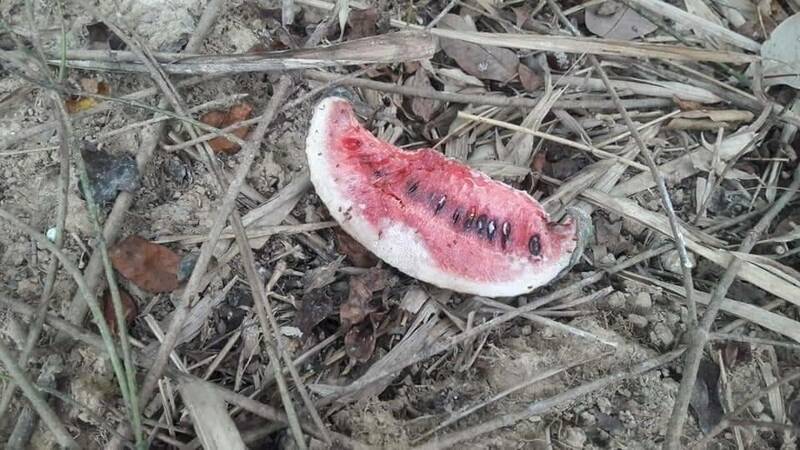 Half-eaten watermelons - found near the area where 20 long-tailed macaques were found dead in Rayong's Klaeng district - are being tested to determine if they were laced with poison, a source at the provincial forestry office said on Thursday. Officials and local villagers suspect that a farmer might have laced the watermelons with poison to harm long-tailed macaques that have recently intruded on farms, a source said. Klaeng precinct superintendent Pil Colonel Chaiyapong Saengpongchai said that police were investigating. The local community meanwhile held a funeral prayer for the deceased long-tailed macaques and buried the carcasses in Wat Yang Ngam's ground. Some 20 long-tailed macaque carcasses were found near half-eaten watermelons on a canal bank in a forest near Ban Yang Ngam (Moo 5) village in tambon Krasae Bon at 11am on Wednesday. Village headman Sathit Kaewkla said the sub-district's forest had a shrine of Chao Por Yang Ngam that villagers worshipped. About 200 long-tailed macaques live and usually hunt for food in the area of the shrine. However, this drought season might have driven the primates to hunt in the canal area near farms. He said the poisoning could have killed more than 20 monkeys as many might have fled into forest before the poison took effect. Krasae Bon kamnan Boonseub Klaewkla, concurring with the suspicion that the monkeys were poisoned due to farm intrusion. He said community leaders would tell people not to kill the protected animals and would have volunteers guard farms to chase away long-tailed macaques.